Learn about the amazing Appalachian Trail below and then call us at to rent Gatlinburg cabins and Pigeon Forge Cabins, so you can hike some of the trails most scenic parts. 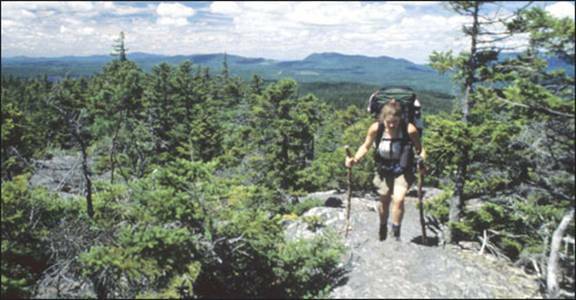 Of the 2,015 miles the Appalachian Trail spans between Maine and Georgia, perhaps no sustained portion is as virtually untouched by humanity as the 69 miles threading the crest of the Smokies. Park your car in the Newfound Gap Parking Area, about 15 miles to the top of the mountain from Gatlinburg and walk the AT north or south for a pleasant walk or day-long hike along the Smokies crest. You can hike 8 miles roundtrip north to rocky crags along the state line ridge at Charlies Bunion. You can also park below Clingmans Dome, a short spur drive south of Newfound Gap, to experience the AT. Take a one mile roundtrip hike to the summit or a 3.6 mile rocky roundtrip to enjoy the views from Andrews Bald on the Forney Ridge Trail. There are many other Gatlinburg hiking trails to enjoy while visiting the Great Smoky Mountains. The “A.T.,” as it's called by hikers, is much more than just a path through the woods. It is a national scenic trail, part of the same national park system that includes Yellowstone, Yosemite, and the Great Smoky Mountains. Its official name is the Appalachian National Scenic Trail. But, unlike those famous parks, it's not a concentrated preserve, with campgrounds and paths within its boundaries. As the longest, skinniest part of America's national park system, the A.T. stretches over 14 different states and passes through more than 60 federal, state, and local parks and forests. Hundreds of roads cross it. In some parts, the Trail “corridor” is only a few hundred feet wide. Maybe the most important difference between the A.T. and other national-park units, though, is that volunteers make it possible. Each year, thousands of people maintain, patrol, and monitor the footpath and its surrounding lands—outdoor lovers like you volunteering hundreds of thousands of hours of their time to taking care of this public treasure. The efforts of countless volunteers made MacKaye’s idea a reality. Today, the Appalachian Trail is best known as a simple footpath, yet it also has other identities — as a greenway, a flyway, a “mega-transect” by which to monitor environmental health. It is the mission of the Appalachian Trail Conservancy to ensure that future generations will enjoy clean air and water, scenic vistas, wildlife and opportunities for simple recreation and renewal along the entire Trail corridor. From Gatlinburg travel 2 miles on South 441 to the Sugarlands Visitors Center, continue on South 44l (New Found Gap Road) to very top of "Newfound Gap." Parking area for Newfound Gap "is" trail head for Appalachian Trail. Appalachian Trailhead is on the immediately left, and is clearly marked. 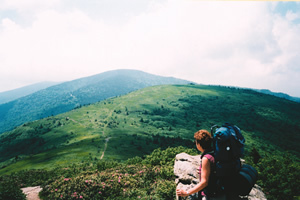 South of Damascus, Virginia, the Appalachian Trail follows segments of mountain ranges in the Cherokee National Forest, ascending to the high country of the North Carolina-Tennessee state line, and the highest mountains along the Trail—several above six thousand feet. Here lie the Roan Highlands, noted for their rhododendron gardens and the panoramic views of the open grassy “balds” such as Hump Mountain. The A.T. continues southward along the state line and through the Pisgah National Forest. Like the White Mountains of New Hampshire, hikers on the high ridges and balds of the southern Appalachians can encounter dangerous weather conditions. Lightning is a particular danger in summer. Sudden snow storms are common, as late as April and May, and can strand hikers. The Great Smoky Mountains National Park, with more than 70 miles of crest line Trail, features the highest elevations of the entire footpath, well above six thousand feet. Clingman's Dome is the highest point on the entire A.T., where the Trail reaches an elevation of 6,625 feet near the summit. The Trail through the Smokies, near Gatlinburg, also has the most rainfall and snowfall on the A.T. in the South, and many hikers are caught off-guard by the snow and cold temperatures that the high elevation causes. Trail information should be posted at Newfound Gap next to bathrooms and main entrance. Is a unit of the National Park Service. Is the nation's longest marked footpath, at approximately 2,175 miles. Is the first national scenic trail, designated in 1968. Houses more than 2,000 occurrences of rare, threatened, endangered, and sensitive plant and animal species. Is maintained by 30 trail clubs and multiple partnerships. There are 165,000 blazes along the length of the Trail. More than 8,000 people have reported hiking the length of the Trail. IMPORTANT: Anyone taking the Appalachian Trail for any length of time, especially an extended hike or campout, you MUST register all this information at Great Smoky Mountain National Park Headquarters several months ahead of time. National Park Regulations require this. Even overnight registration is required. Casual or photography sessions on the Appalachian Trail do not require this. But hikers must be prepared at all times in the "Smoky Mountains" for very rough weather.